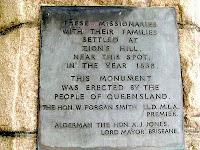 It may surprise some to know that the first free settlers in Brisbane were German. They were missionaries who came here at the behest of Rev JD Lang in order to "civilise" the indigenous population. 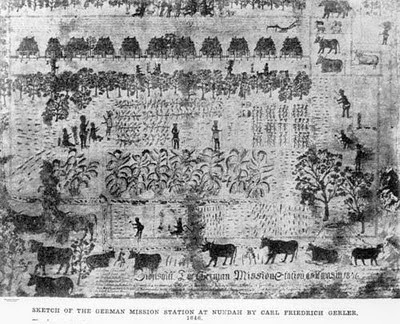 The first mission was formed at Zion's Hill in 1838, and was a joint effort between Lutherans, Presbyterians and Pietists (a Lutheran offshoot). 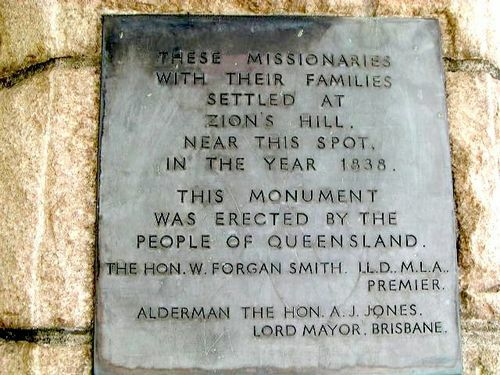 Zion's Hill was the name the missionaries themselves gave to the mission station they established on Kedron Brook just north of Brisbane Town, which became known to others as German Station. We now call the suburb Nundah. The first fifteen members of the missionary band arrived in April 1838 and a further number arrived in June. 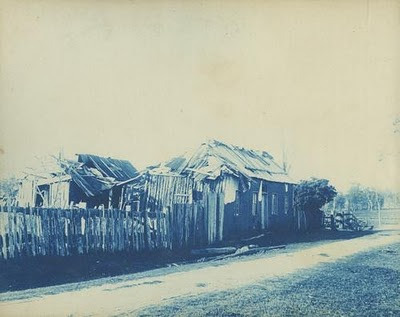 At the time of landing in Moreton Bay the party was comprised only of adults, but it didn't take too long for the children of these first free settlers to arrive - there were eleven babies born by 1841, the first children of free settlers in Queensland. The missionaries set about making themselves self-sufficient, planting crops and raising cattle. They also studied the language of the aboriginal inhabitants, the Jagera and Turrbal people; indeed, they were far more assiduous at this than the English soldiers and convicts had been. The initial relationships with aborigines were quite cordial. The sketch below was made in 1846 by Carl Gerler, one of the missionaries, and it shows a group of aborigines being schooled by a missionary teacher as well as the cattle-raising and farming activities developed by the whites. Although these families formed a cohesive and productive group, the success of the mission would only be judged by the conversion to Christianity of significant numbers of the native population. In this regard the mission was deemed a failure - the aborigines preferred their own Dreamtime stories and were not to be seduced by the fairy tales of the missionaries. Funding to the community by the New South Wales government was withdrawn in 1843, after only a few short years of operation. There were other factors at work too - the English inhabitants of the colony were suspicious of these "foreigners" and jealous of the large parcel of ideal farming land that had been handed to them. The mission station was gradually run down, although many of the German immigrants remained in the area. The photo below shows the remnants of the mission station housing, taken around 1895. There are still reminders of these early settlers in the names of some of the streets in the area: Gerler, Rode, and Zillman are a few. 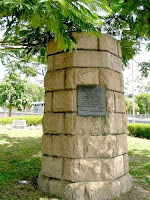 In 1938 the centenary of the first mission was celebrated with the unveiling of a memorial to the settlers by the premier of Queensland and other dignitaries. Here is a photo taken then. 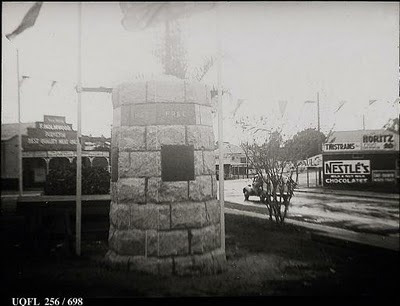 The memorial is situated next to the main thoroughfare, Sandgate Rd, which has now been diverted around the old Nundah shopping centre evident in the picture above. The memorial is marooned on an island and thousands of cars whiz by it daily without a thought for these Brisbane pioneers. I love reading stuff like this on your blog. I have done some family history research for friends of mine who are of German descent through this scheme. One had ancestors who settled somewhere around Dalby, I think and another around the Peachester area, where groups of these German immigrants had lived. They were considered to be hard and clean-living workers. I think that their lack of English would have caused suspicion with the English settlers and I know of some cases where the Germans anglicized their names. Whatever you think of missionary work, targetted at non-European populations, you have to admire these people who left the comforts of home and travelled to the unknown. Goodness knows what they thought about the heat, humidity, animal life, diseases, lack of community infrastructure etc. I get upset when I run out of handcream. They leave me speechless with their bravery. Hels - I think any immigrant to Australia in the 19th century was brave, and these folk particularly so. Some religions still send forth missionaries, confident that theirs is the only way. I find that sort of arrogance stupefying. My Prussian Ancestors arrived in Australia in 1844 and were employed by George Wyndham in the Hunter Valley. My great grandmother,Born in Braxton went to New Zealand in 1880 and still spoke German and her english was heavily accented even though she was third generation Australian!. Just getting to Australia was hard ,many perished on the ships on the way here so they had to be very tough to survive in this new Country. Ironically, the monument to the German pioneers is on the land of one of the English pioneers, George Bridges. I have a book that I will have to dig out with a lot of the Nundah history including the family names of the early settlers that transformed now into suburb and street names... The Zillman family comes to mind - and of course the suburb of Zillmere that was named after them.